↑ Pytheas ওয়েব্যাক মেশিনে আর্কাইভকৃত ১৮ সেপ্টেম্বর ২০০৮ তারিখে Andre Engels. Retrieved 16 December 2006. ↑ ক খ Arctic Ocean CIA World Factbook. 30 November 2006. Retrieved 7 December 2006. ↑ U.S. National Oceanographic Data Center: Global Temperature–Salinity Profile Programme. June 2006. U.S. Department of Commerce, National Oceanic and Atmospheric Administration, National Oceanographic Data Center, Silver Spring, Maryland, 20910. 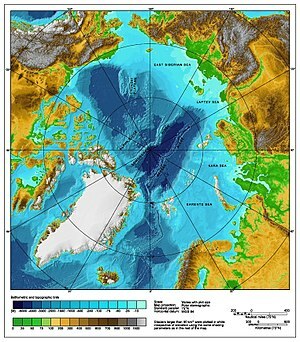 Date of Access, <http://www.nodc.noaa.gov/GTSPP/>. ↑ Fetterer, F., K. Knowles, W. Meier, and M. Savoie. 2002, updated 2009. Sea Ice Index. Boulder, Colorado USA: National Snow and Ice Data Center. Digital media.